Last Friday we drove about an hour and a bit east of Canberra to visit the Monga National Park, a patch of wet sclerophyll forest on the escarpment above the south coast of New South Wales. We had hoped to find some Monga waratahs (Telopea mongaensis) in flower, but we were at least a month too early. 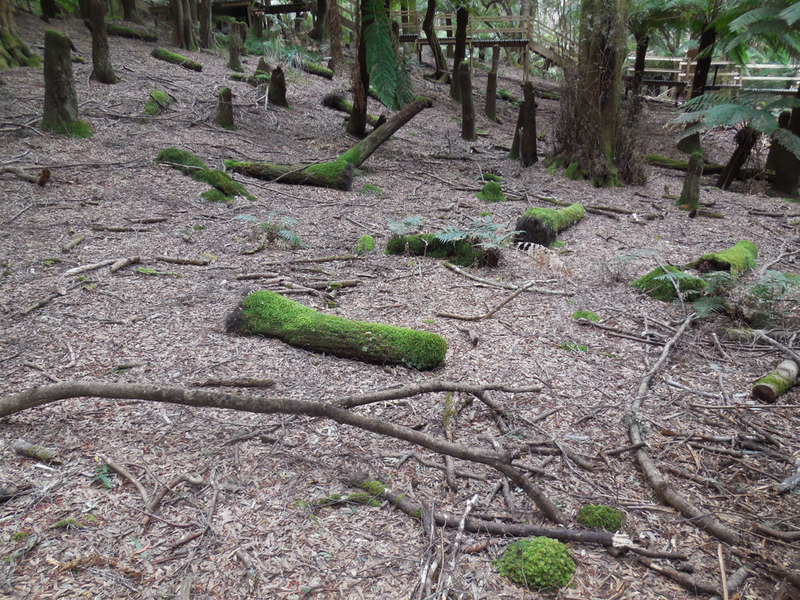 We did visit Penance Grove, where in the 1980’s, prior to the forest being declared a National Park, some sad and selfish individual came in and cut out the tops of many of the tree ferns growing in this remnant rainforest glade. The tops of tree ferns will re-grow from their trunks, but the section left behind just dies. These protected plants are stolen for illegal sale to gardeners or nurseries. Even today, 30 years later, the devastation is there for all to see. In some ways it would have made an excellent subject to paint, but I found it all too painful and depressing. We decided to move to the nearby picnic ground where we had some lunch. While we were eating we were visited by several flibertigibbet Grey Fantails. After we walked down to the Mongarlowe river, along a track that promised waratahs at the right time of the year. At the water’s edge the vegetation was growing thickly and I had quite a fiddle to find a spot where I could set up my stool without being stabbed by stray lomandra leaves (a spiky tipped sedge-like plant). I managed a perch in the end, but failed to capture a good likeness of the far bank of the river. 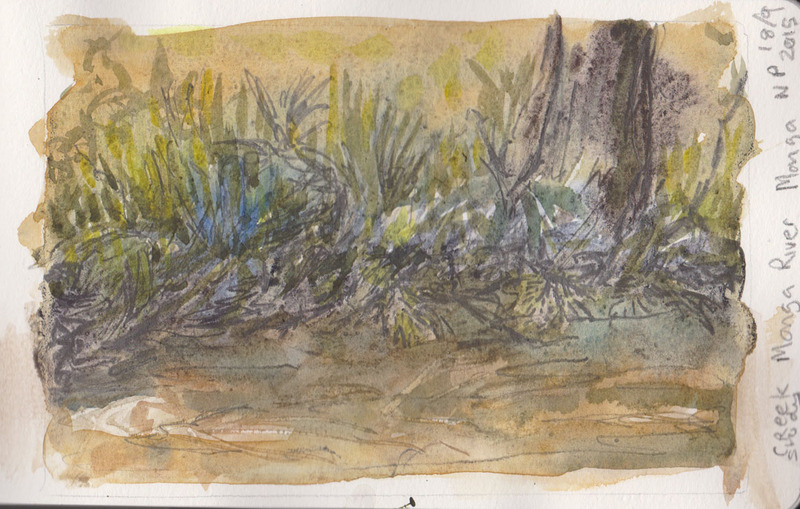 My attempt at wet into wet paint became such a soggy mass that the super ‘darks’ I wanted to put under the vegetation just kept blending into the areas above. Drying time was not optimal, as our earlier sunny day had, by this time, settled into a dull overcast. 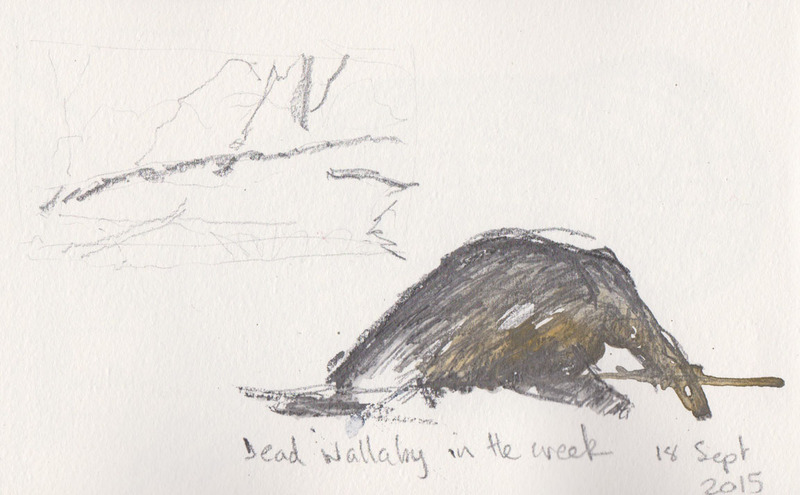 I was also trying to avoid looking at what was in the water just below me, the carcass of a dead wallaby. Thankfully odourless, as the fast-running water was washing the smell away, I didn’t really want to look at the remains of this once beautiful creature. In the end I decided to make a quick sketch of it and though the subject matter was rather grim I think it was a better outcome than my overworked riverbank. I guess this just proves that not every sketching expedition pans out the way you expect. 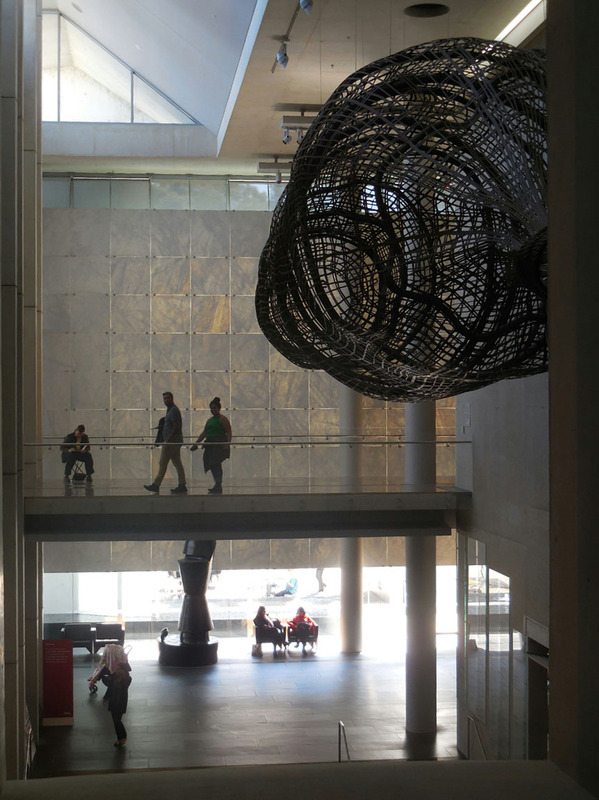 The 16th of September was Papua New Guinea’s Independence Day, so what better way to celebrate than return to the Myth + Magic exhibition at the National Gallery of Australia. 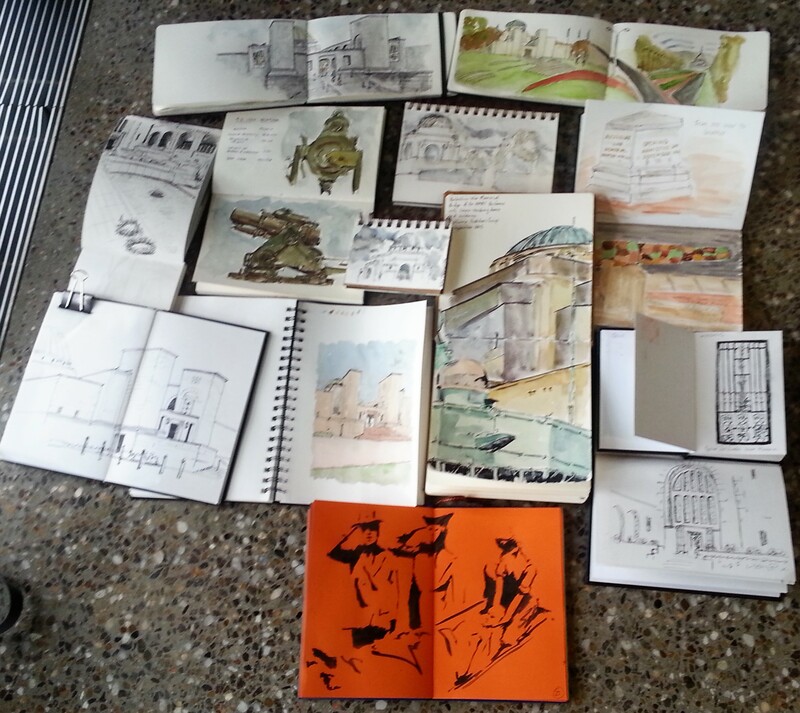 This time I also managed to drag some friends along, as well as my partner, so we all set about sketching. 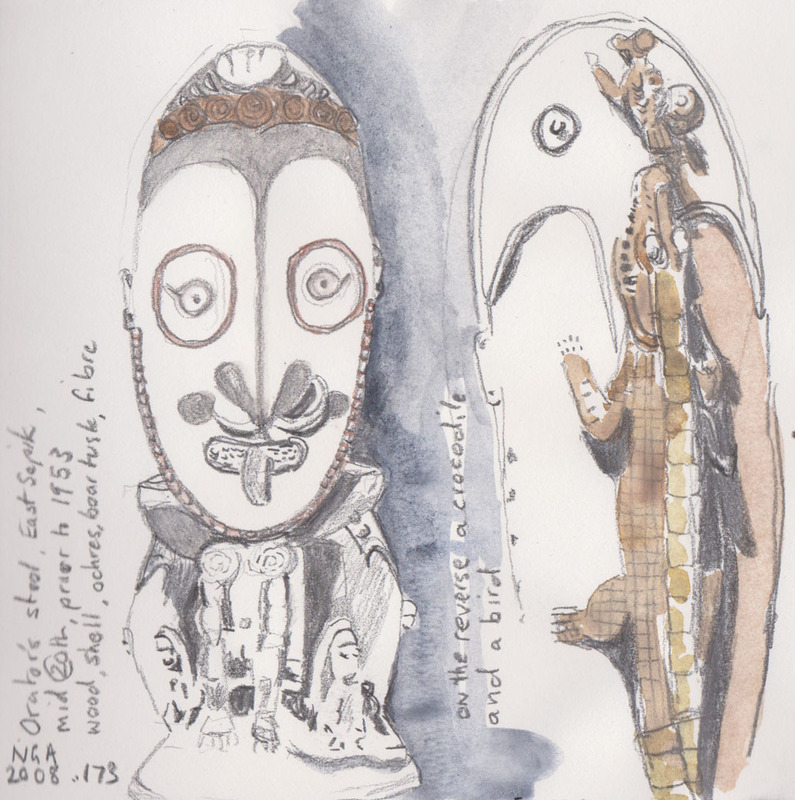 My first target was the Orator’s Stool from the East Sepik. I started with the face and enjoyed working with the deep shadows cast by the dramatic lighting. It was only after I’d finished this first drawing and went to record the details of the work, that I found the carvings of the crocodile and bird on the reverse of the stool. 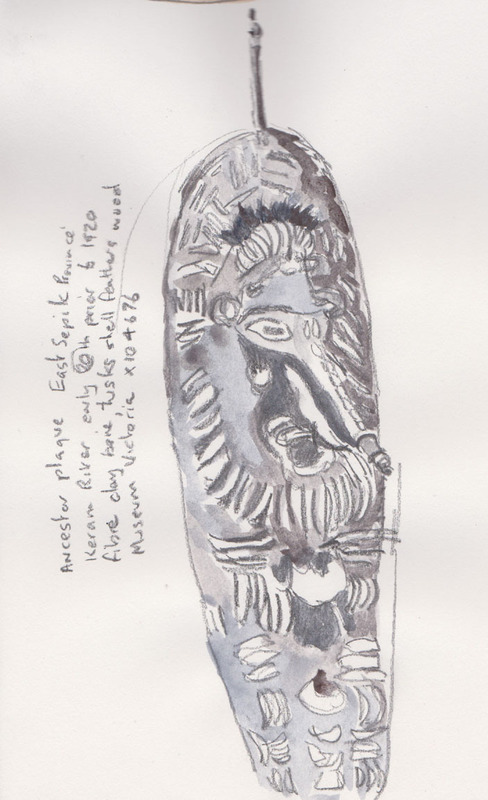 I still had some 20 minutes before our meet-up time so I went and did a ‘quick’ study of this ancestor plaque. This work has a very strong presence. It is made of fibre, largely for the backing and is covered with thick grey mud. It is decorated with lots of embedded pig tusks and shells. The image wears a headband of cassowary feathers. I haven’t captured much of its ‘presence’ so I will try to return and focus on this piece again. After the drama of the exhibition space it was somewhat of a relief to retreat to the airy lightness of the Members Lounge for lunch. 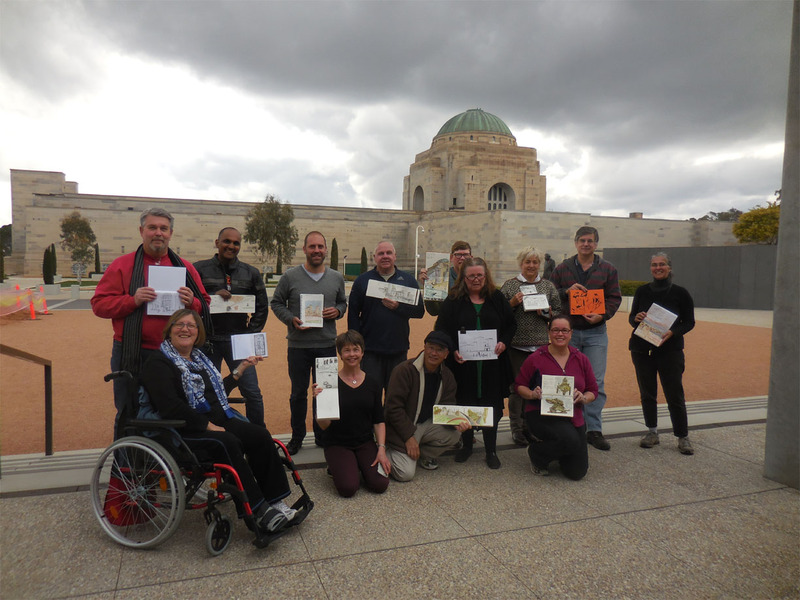 Afterwards, our friends decided that they wanted to look at the Aboriginal and Torres Strait galleries so we headed off there for a final sketch. 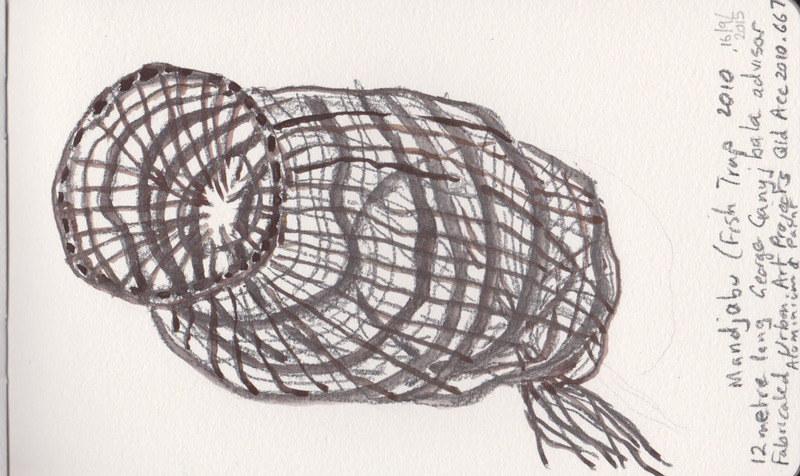 I sat out near the entrance to draw the giant, 12 metres long, fish trap, that hangs above the gallery foyer. I didn’t realise that I was being observed, but this photo gives you an idea of the scale of the work. 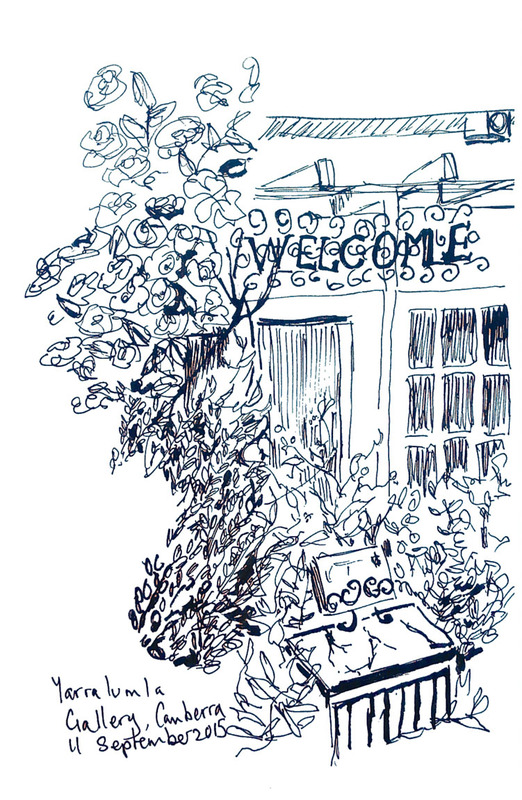 Here are two drawings from different botanically-related outings today. The first was drawn at the Yarralumla Gallery next to the Heritage Nursery where I’d been buying plants to help renovate our front garden. While there is nothing particularly different with this drawing, the notebook its drawn on is something fairly new, a Leuchtturm Whitelines Link® notebook. This notebook is designed to be used in conjunction with an app for your smartphone so that it can be digitised and shared easily on a variety of platforms. Enough of that for the moment as I plan to explain more and do a bit of a review in another post. Our second outing was to the Australian National Botanic Gardens, not as you may expect to see the plants, but rather to check out the newest farmer’s market in Canberra. This was only the second week of the Eat Local Friday market’s operation so we didn’t know what to expect. There were plenty of people there and they seemed quite keen to get among the produce. It is unusual to see a market in such a pleasant setting and I’m sure that the extra foot traffic will benefit the gardens. I set up at one end of the stalls and was pleased to have plenty of people to include in the scene. I struggled with capturing the light coming from behind the stalls, so it looks like that’s something else I’ll need to work on. I was quite intrigued at the number of people who walked several metres past the last stalls and then asked whether there was anything else there. No more stalls I’ll grant you, but only the whole of the gardens at the height of it’s springtime flowering! I’ve said it before that drawing faces is one of the biggest challenges I have in drawing. 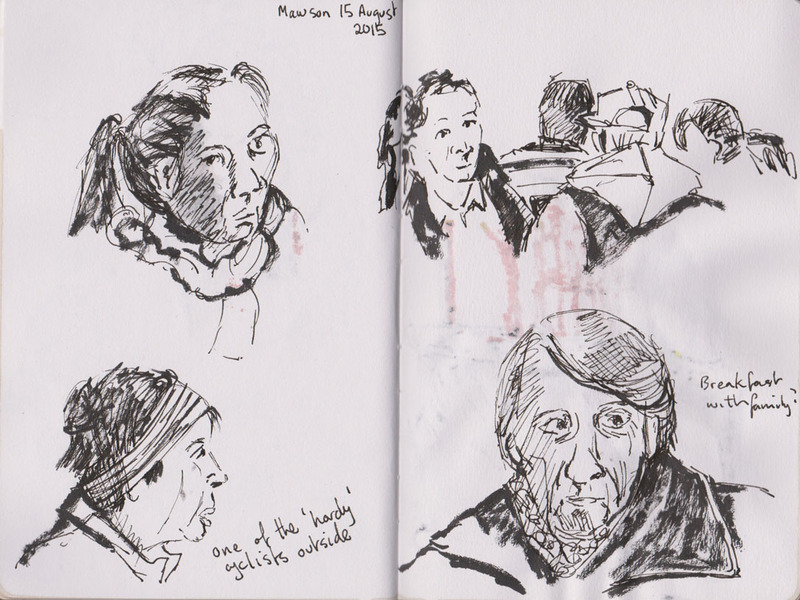 I’m not even talking ‘likenesses’ – I don’t expect to become a portraitist – I just want to draw someone who looks like an individual. 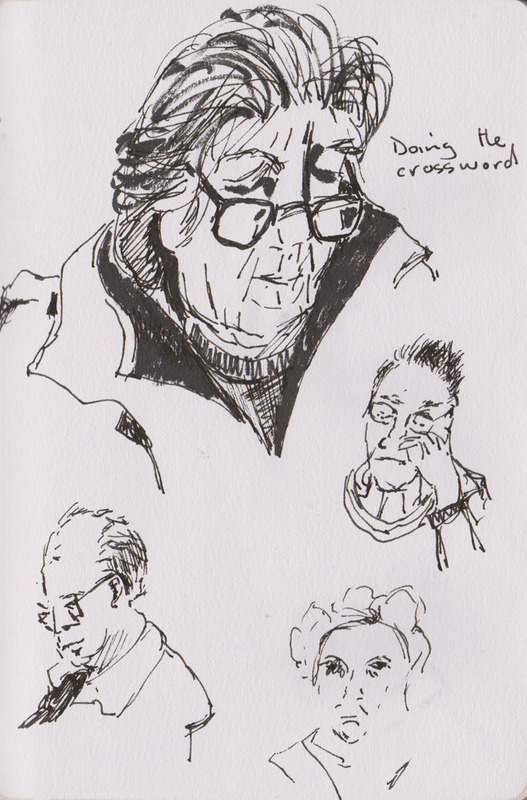 This is currently the bread and butter of my sketchbook routine, go to the coffee shop and draw people’s faces. I opted to do the Marc Taro Holmes workshop at the Singapore Symposium to try and get a handle on how I could approach this task and I found it quite helpful. 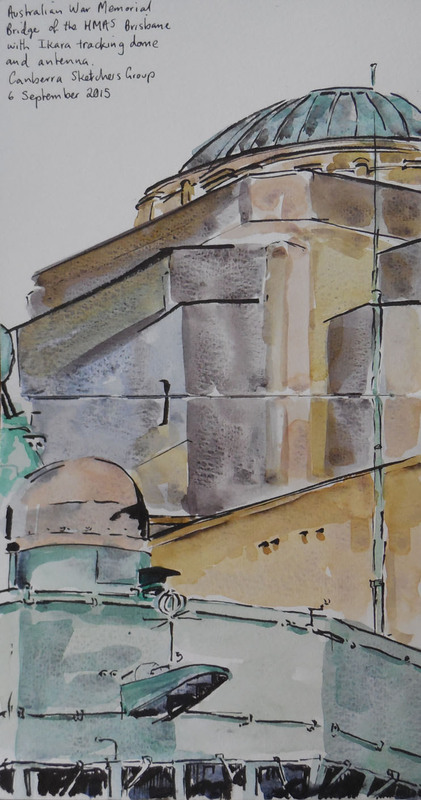 Marc has very kindly posted the link to his notes for this class on his blog. Here’s last night’s effort. 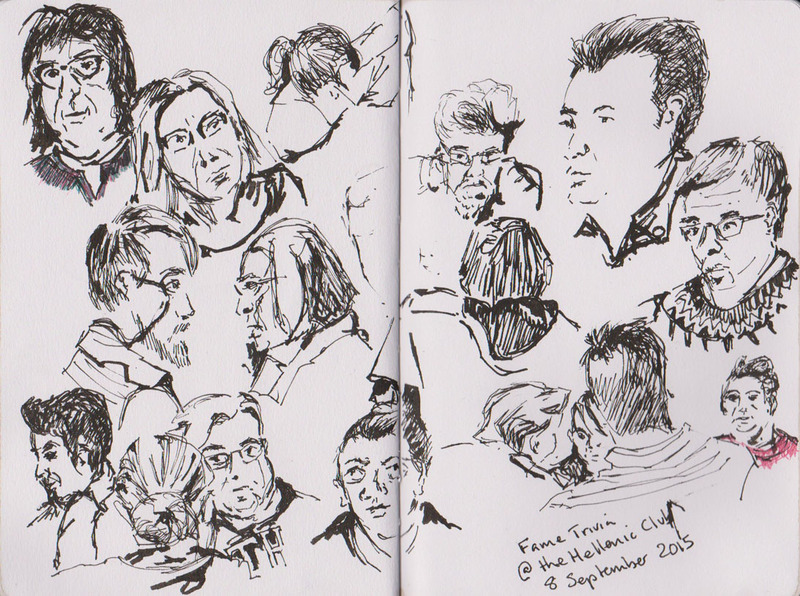 A double-page of faces and gestures from our pub trivia night at the Hellenic Club in Canberra. They may not recognise themselves, (possibly better if they don’t), but I’m happy that at least these people look like individuals.